Last week our house got upgraded from 75/75 megabit internet service to gigabit. 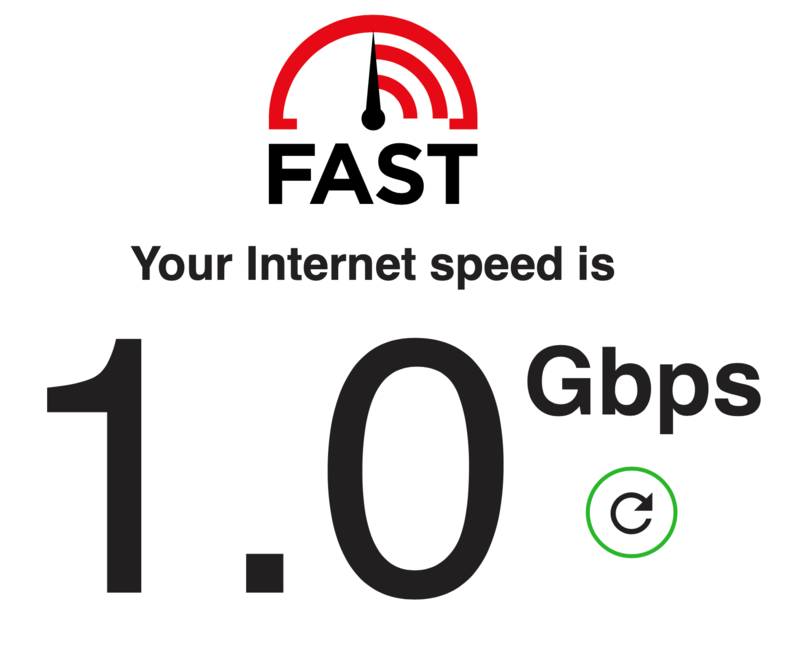 Admittedly, that speed test was one time only, when only my iMac was connected, via ethernet, directly to the modem. Still though! Look at that! 1.0 Gbps! I learned a couple things during the installation — and subsequent rework of my local network — which I thought may be worth sharing. I originally got FiOS back in 2008. I was overjoyed to be leaving Comcast behind, and getting push-your-hair-back-like-a-Maxell-ad 15 megabit speeds. A few years ago we upgraded to 75/75. The symmetric life (having uploads as fast as downloads) is really the best. By default, most FiOS installations bring internet into the house, from the ONT, via coax. This is way easier and way cheaper for Verizon than using ethernet would be, and for most users, it doesn’t matter. Verizon only has to pipe a line from the ONT — typically behind the house — to the crawlspace/basement or attic, where it’s plugged into the in-home coaxial network used for cable TV. Most users wouldn’t care about that, as they happily lease Verizon’s router for an obscene amount of money each month. For me, once I realized I had (but didn’t exercise) the option of an ethernet drop instead of coax, I was really bummed. For the last ten years, I was stuck with Verizon’s just-barely-inoffensive-enough-to-be-bearable Actiontek router. I couldn’t use any other router, because no other routers can take the internet in via coax. Gigabit installations, however, compel Verizon to bring ethernet to your router. While mostly a win, I learned that the installers have extremely strict rules about where they can put the ethernet drop. From what I could put together, they are pretty much bound to do the installation on an exterior wall if at all possible. That led to an unusual but ultimately workable installation within my in-home office, across the room from where my networking equipment lives. Having the internet come in via ethernet opened up a very important possibility: perhaps I don’t need to use the Verizon-provided router after all? That router is $200, if you buy it outright, or something like $12 each month if you lease it! It seemed, at a glance, that I could finally switch my Eero from merely being a bridge to being the router too. In fact, this useful post seemed to indicate the same. Despite it being extremely trendy, we are not [yet] cord cutters. That means we still have a cable box. The cable box gets its channel guide information via the internet. The cable box gets internet… via coax. The Verizon answer for this is to connect your router to ethernet (for the internet) and coax (to bridge the internet onto the coaxial network). Having ditched the Verizon router, I now needed a way to get the internet onto the coaxial network. A MoCA bridge… bridges… the ethernet and coaxial networks. They’re annoyingly expensive; this is the one I purchased years ago and had handy, but it appears this is the modern replacement. Regardless, after hooking the router into the MoCA bridge (via ethernet) and then connecting the bridge via coax, I was able to get our cable box back on the internet. • Can eliminate Verizon Router completely. • Smaller, simpler device. Less power consumption. • Additional unit to purchase. • Does not support remote access to DVR, on-screen caller id or VZ’s CPE management interface. That got me thinking. Before I abandoned my old Actiontek router, I took a screenshot of the port forwarding settings. Conspicuously, there were a couple of entries for IP address .100 that I didn’t recall entering. Furthermore, the IPs for every other device on my network started with .2; not all the way up at .100. I suspect one or more of those aren’t necessary, but, I turned off WiFi on my phone and then I attempted to use the FiOS TV app to schedule a TV recording on my Verizon DVR. Sure enough, it worked! All told, a good day.